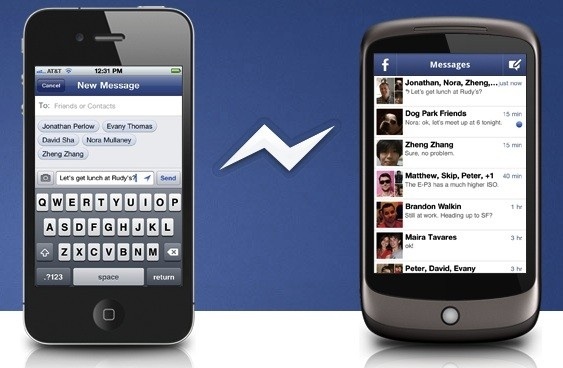 Facebook has just released a new Android and iOS app called Facebook Messenger, and it's exactly what it sounds like. Basically, Facebook has taken its messaging system, used their Beluga team to simplify it a bit, and pushed it out as an independent app. You can message your contacts without using up SMS (similar to things like BBM, Google+ Huddle, iMessage, GroupMe, Fast Society, and plenty of others,) and you can also create group messages on the fly as well. People will see these messages show up in the Messenger app, their Facebook inbox, or by SMS if they don't have the app installed. You can also share your GPS location and attach images to the message conversations as well. If you've used Beluga or Facebook, then you know how to use this. You can grab it now from the App Store and Android Market.